In February this year, I ascended Creag Meagaidh in full-on winter conditions with snow from car park to summit. 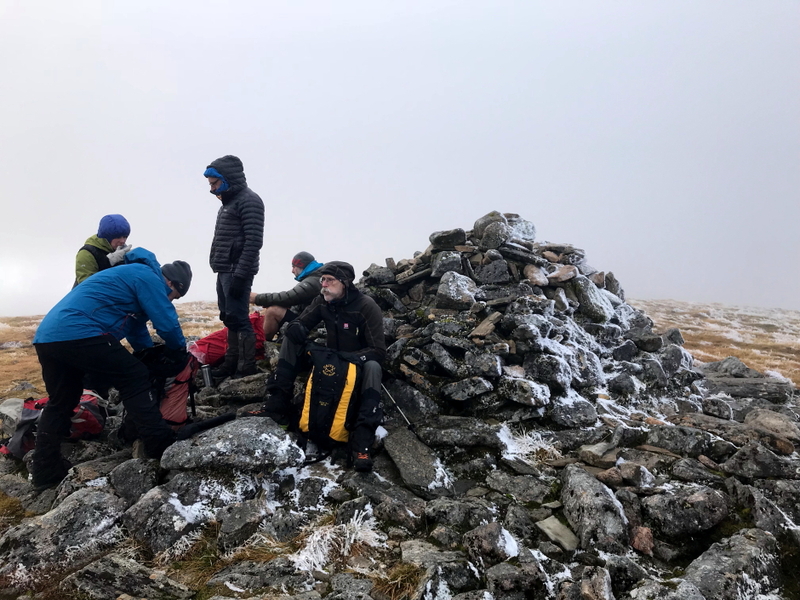 This made attaining the summit a tough enough objective, ascending its four Munro Tops would have to wait for a return visit. 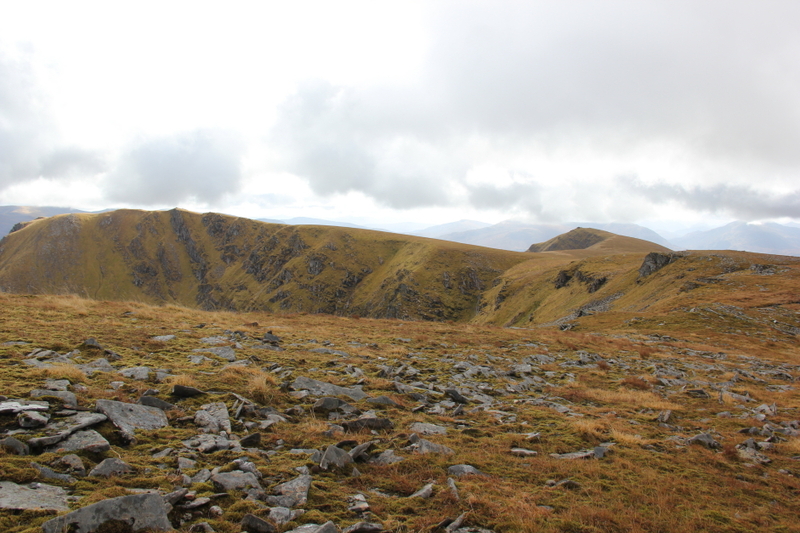 On Saturday morning, I decided it was time for that return visit to ascend not only Creag Meagaidh's summit but also its four Munro Tops. 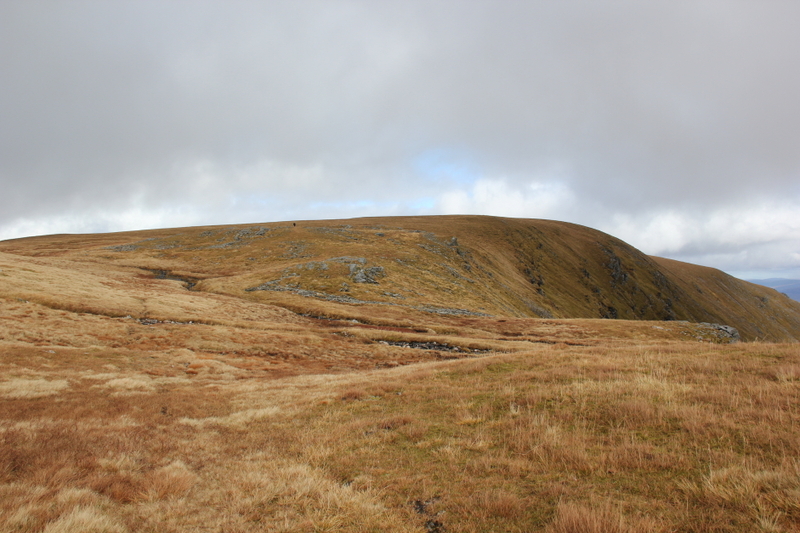 On arrival at the Creag Meagaidh car park, I got suited and booted and set off walking along the footpath which runs alongside the road leading to Aberarder. 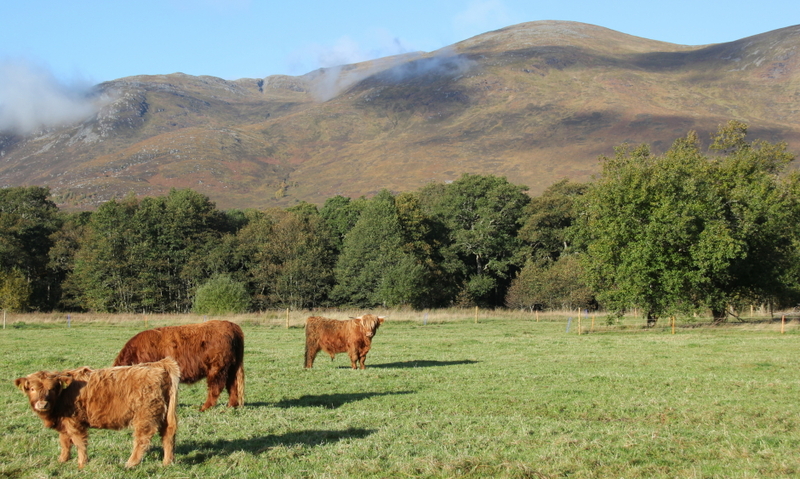 After walking a couple of hundred metres I stopped to photograph some H'lan Coos. Beyond the coos I followed the track leading to Coire Ardair. 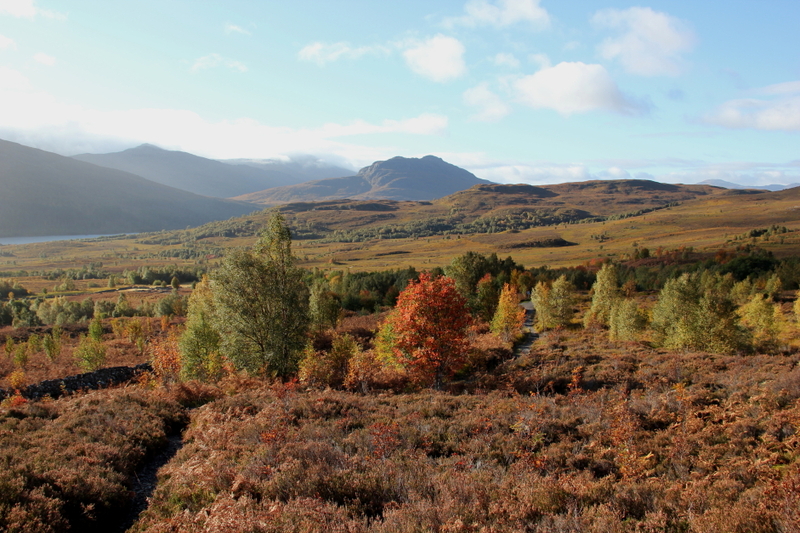 The weather was nice albeit cold and the autumnal colours made for lovely views. 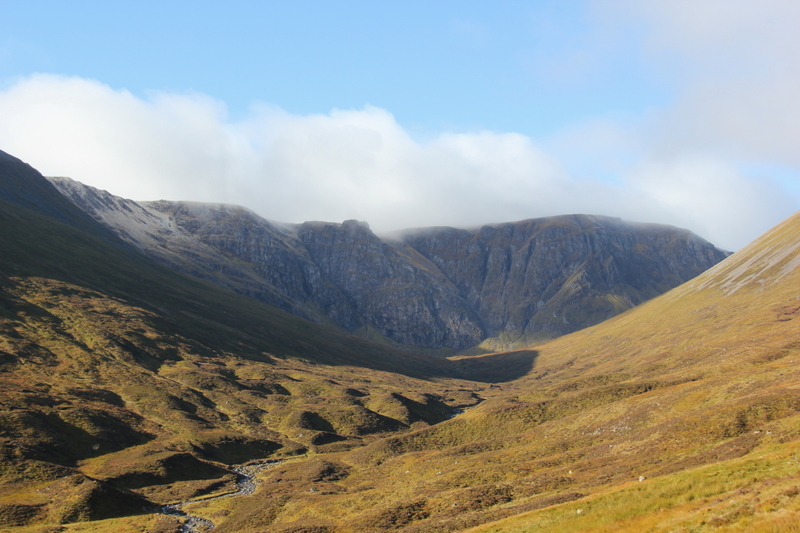 As I made my way towards Coire Ardair, I could see a dusting of snow on the northern slopes of the coire. Winter is on its way . 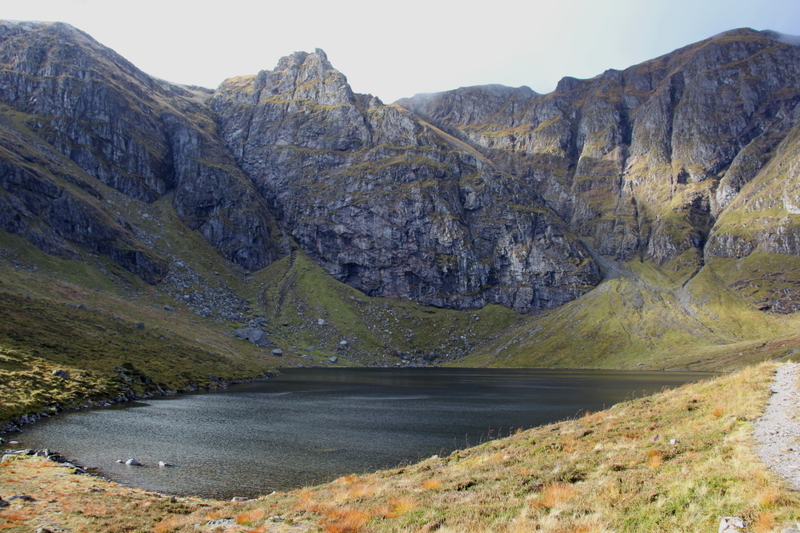 On reaching the lochan, which is a worthwhile walk in its own right, it was difficult to take good photographs due to the brightness of the sun sitting just above the cliffs. I therefore didn't stop at the lochan, as I have done on two recent visits, but instead carried on towards the col known as 'the Window', a slope very prone to avalanche in winter conditions. The ascent of the window was fairly unpleasant compared with my winter ascent eight months previous. So much nicer to ascend crisp neve with ice axe and crampons than to ascend loose stones and scree. On reaching the top of the window I followed the track on the flank of Stob Poite Coire Ardair before turning to ascend the upper slopes of Creag Meagaidh. 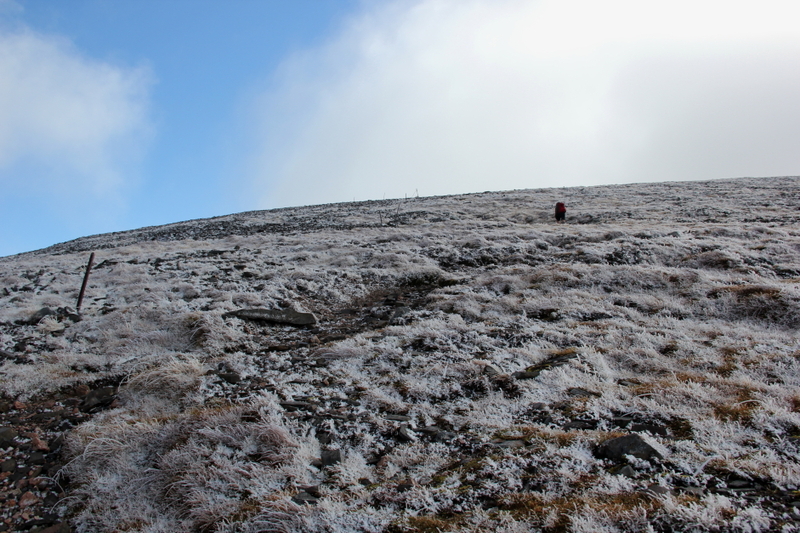 I was soon walking amongst hard frost and was overtaken by someone obviously much fitter than myself. I am getting old . 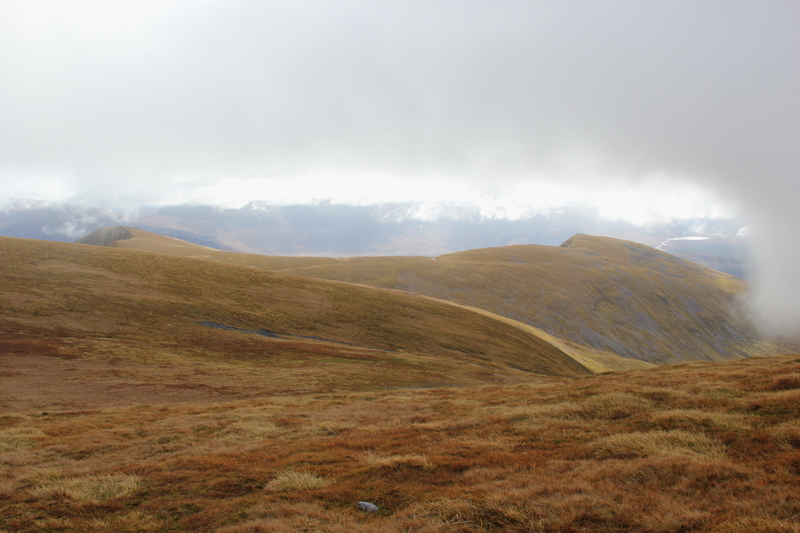 On reaching the plateau, I noticed the cloud was dropping so instead of following the track leading towards the summit I took a route further back which allowed me to see the topography of the tops such that if I did end up walking in cloud I had a reasonable idea of my route. 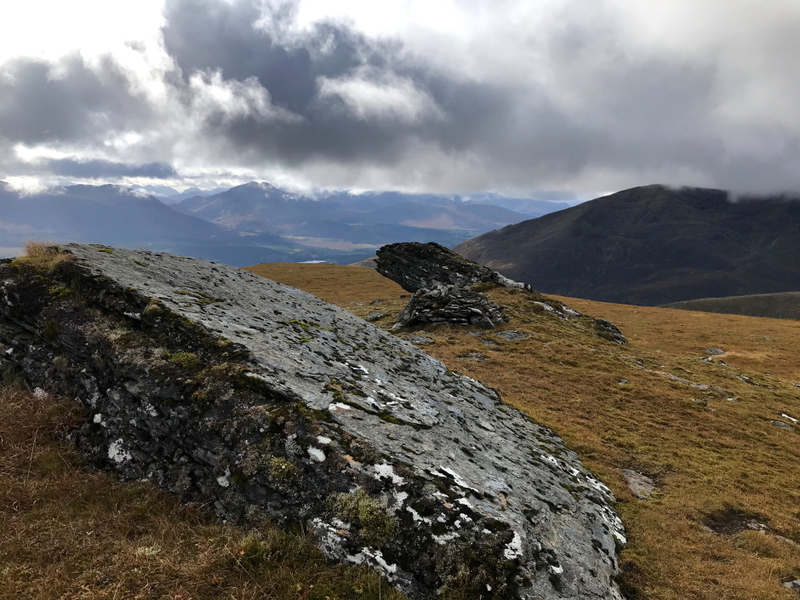 On reaching the summit I said hello to other walkers who were having a break, touched the summit cairn and immediately set off to ascend my first Munro Top of the day. 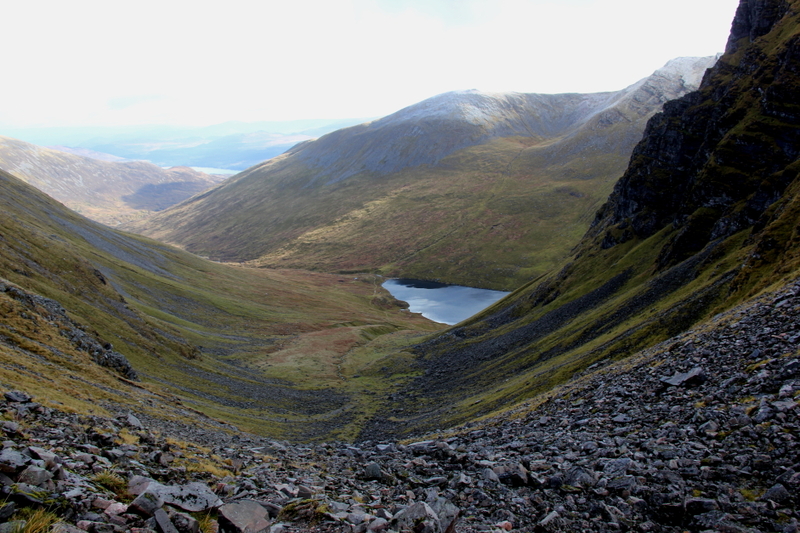 Although An Cearcallach is closer to Creag Meagaidh as the crow flies, Meall Coire Choille-rais is closer on foot. 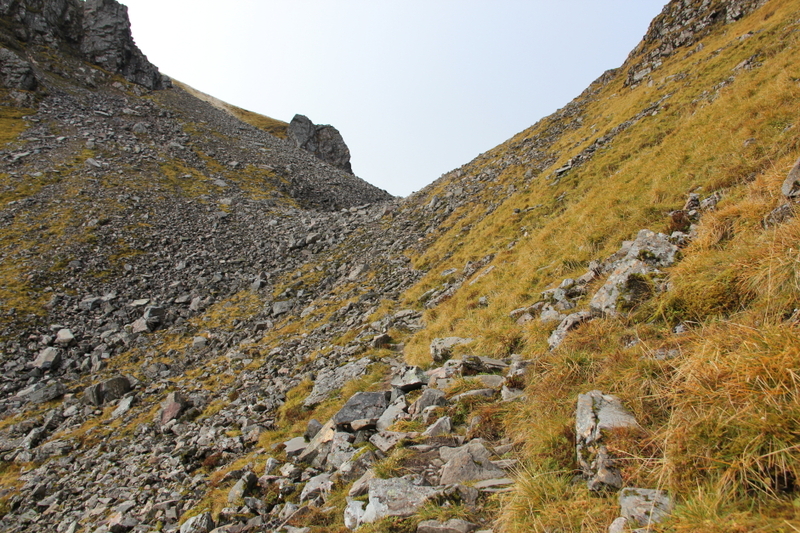 I therefore made my way towards Meall Coire Choille-rais. 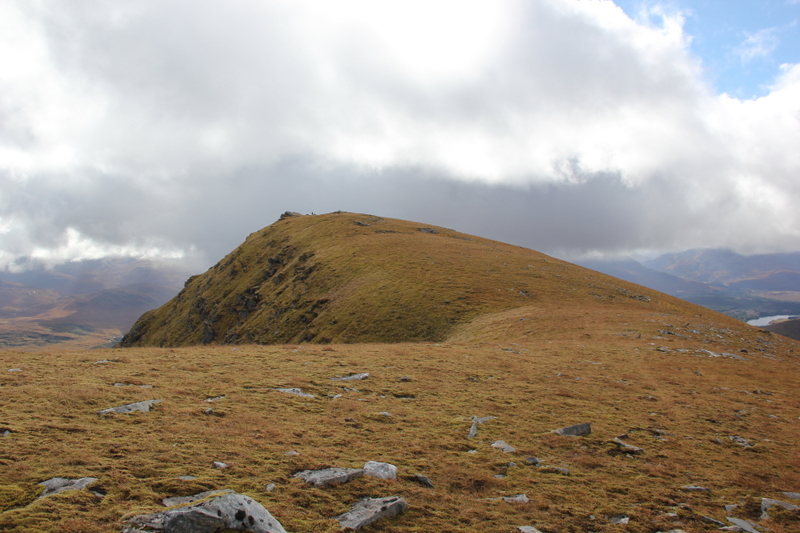 As I made my way towards this top I could see seven other people out on these tops which was somewhat surprising as most people normally just head for the Munro summit. 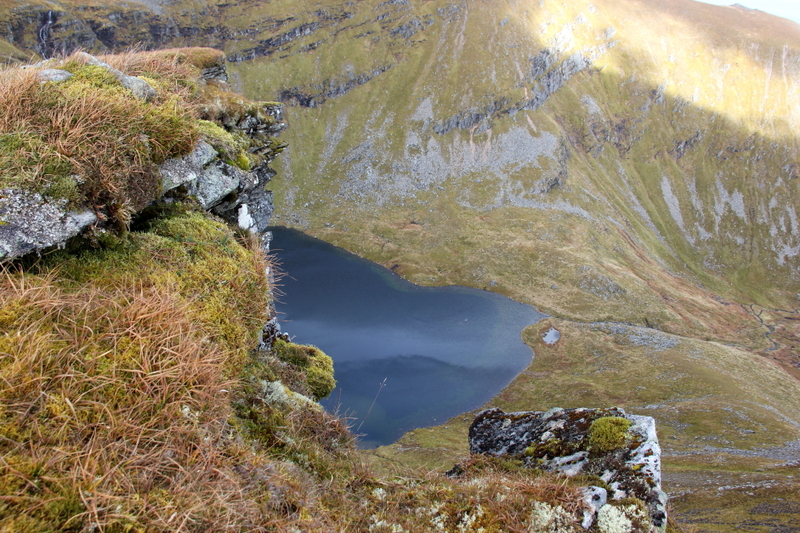 On reaching the summit of Meall Coire Choille-rais I visited each of its potential high points including having a peer over the cliff edge down to Lochan Coire Choille-rais, a stunning wee lochan that I had not seen previously. As I approached this summit I said a quick hello to an elderly gentleman who I would meet again at the next summit, and the next summit and then soon thereafter we would walk together out to the car park. 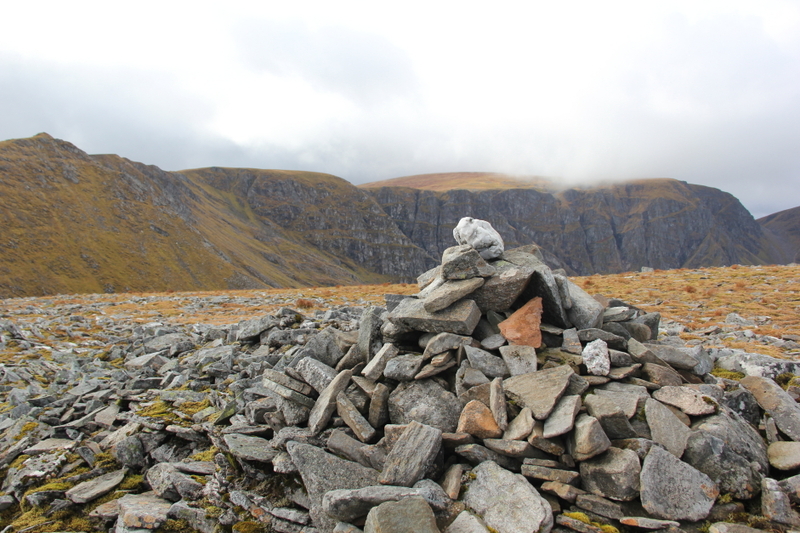 It didn't take long to reach An Cearcallach from Meall Coire Choille-rais. I didn't hang around for long at the summit. 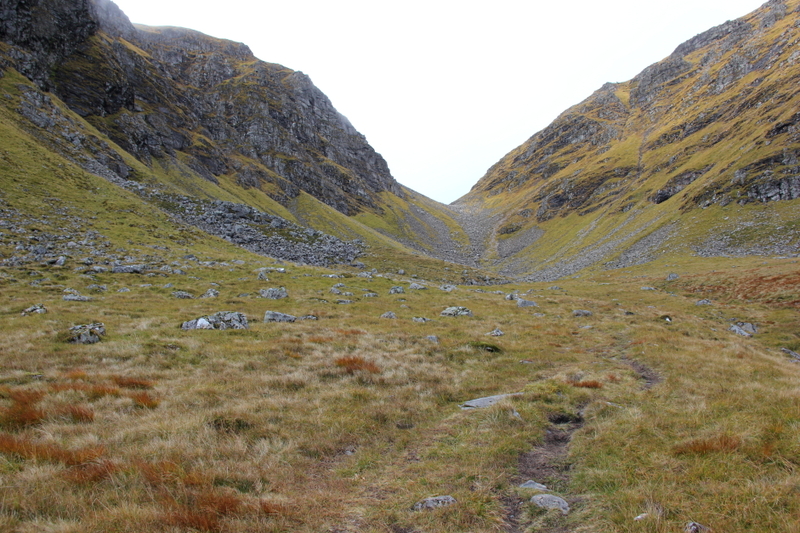 The walk back from An Cearcallach past Meall Coire Choille-rais and out to Puist Coire Ardair was pleasant via short grass with hardly any loss of height. Puist Coire Ardair was the only top out of the four that I had definitely ascended previously way back in 2001 during my first ascent of Creag Meagaidh. 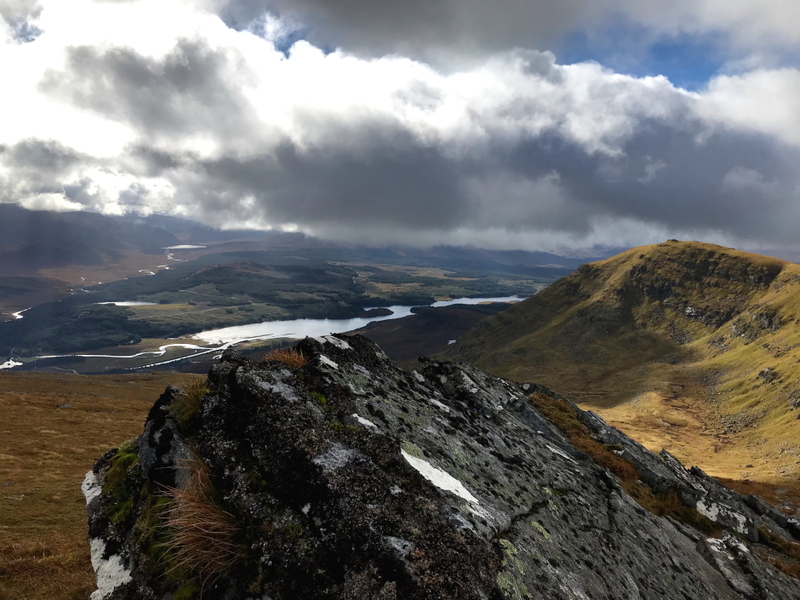 From Puist Coire Ardair I walked with the elderly gentleman who was out trying to complete a second round of Munro Tops (30 remaining). 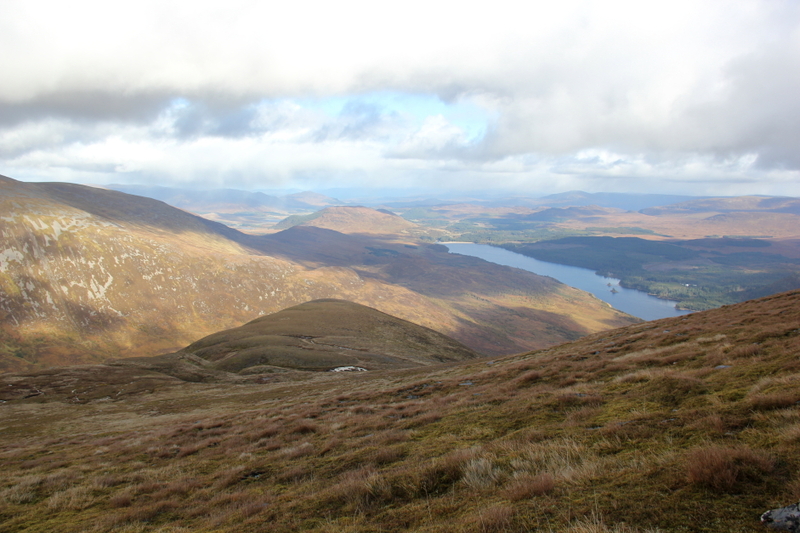 I will be happy to achieve a first round of Munro Tops which for me will mean a "Full House" i.e. 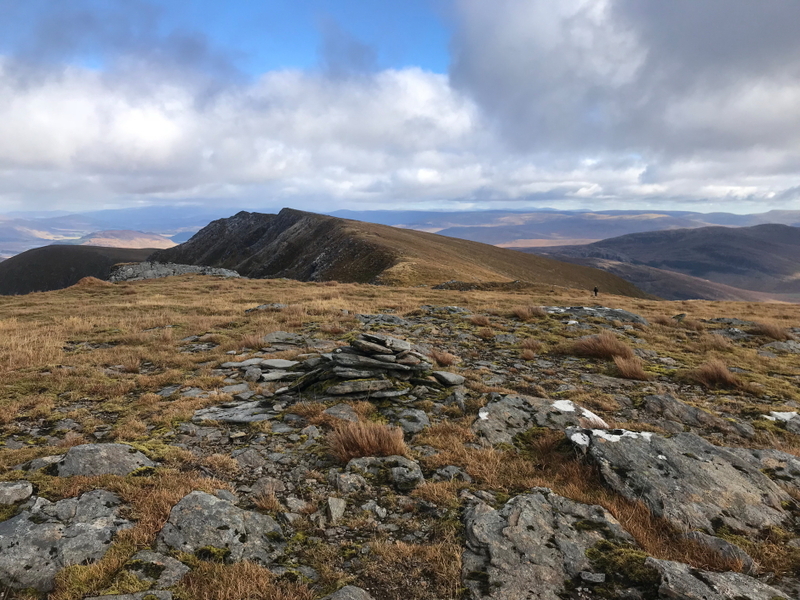 completion of Munros, Munro Tops, Corbetts, Grahams, Donalds and Furth, something only 53 people are known to have done to date. 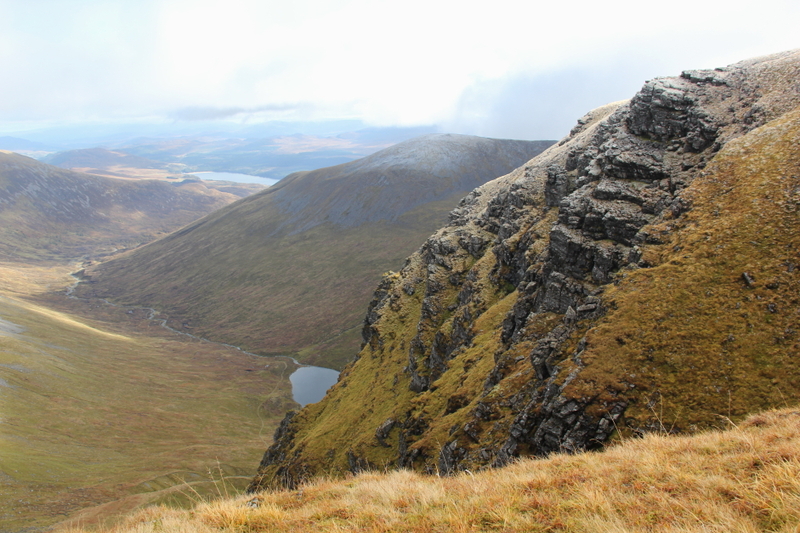 We soon reached the summit of Sron a' Choire where we stopped for a bite to eat and to have a drink, my first stop of the day! From the final Munro Top we made our way back towards the car. The initial descent was really pleasant but the final descent was steep and via fairly awful terrain. During the descent we picked up an ATV track which was little better than the trackless terrain. It was a huge relief to eventually reach a more substantial ATV track which we followed back to the bridge over the Allt Coire Adair. 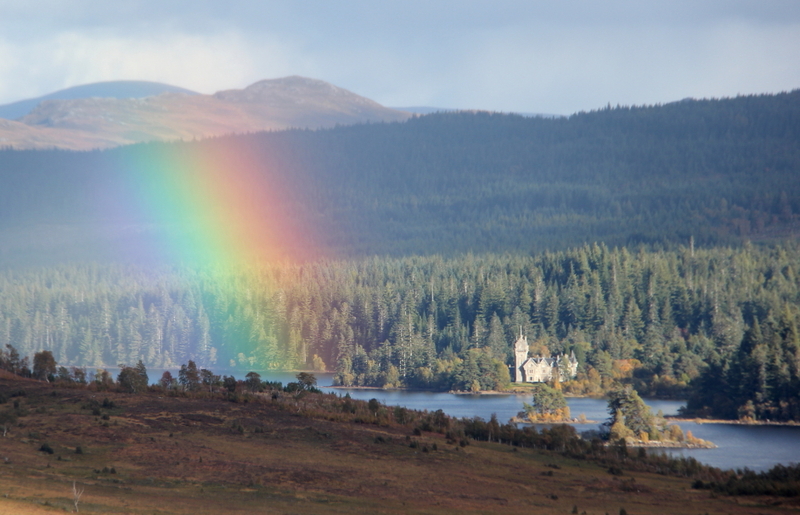 During the descent I stopped to photograph a small rainbow next to Ardverikie House which is possibly better known as Glenbogle in the TV programme Monarch of the Glen. 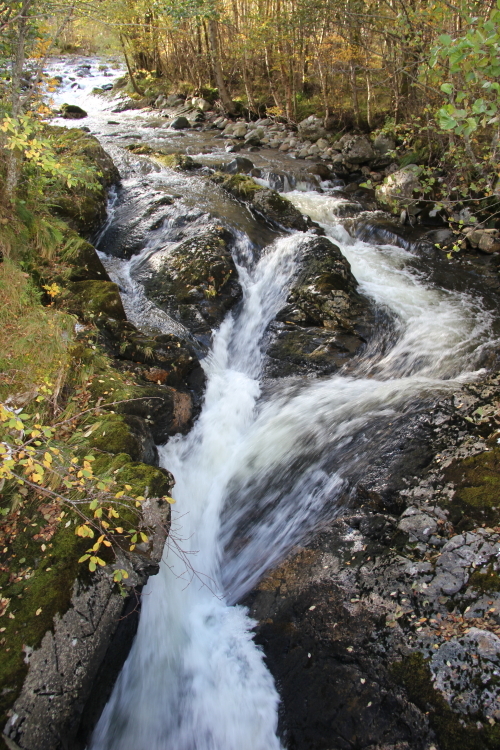 There is a nice linn at the bridge. From the bridge it was back onto excellent track for the final walk out to the car. 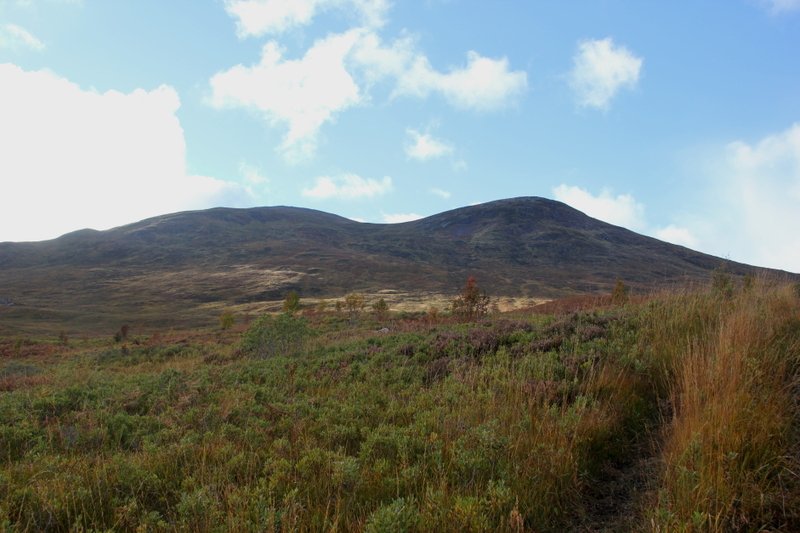 It was nice to walk in company during the return from Puist Coire Ardair to Sron a' Choire and back out to the car. We didn't exchange names but if you read this, best wishes with your final circa 30 Tops.